The Heebee-jeebees, a Calgary-based performance group, provided us with pure musical energy as part of our May 11, 2013 Energy: Full Spectrum event. Enjoy their internationally-acclaimed, award-winning comic a capella style, and break out your light sabre if you dare to join in! 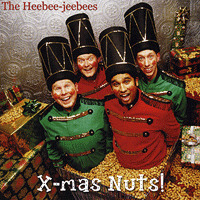 It wouldn't really be Christmas without a hilarious Christmas parody CD from Calgary, Canada's favorite male humorous quartet. While "Waiting Under The Mistletoe," "Falalalala," and "Xmas Nuts" are extremely tough acts to follow, "Christmas Crackers" takes rampant silliness to a whole other level! First, let's give some major kudos to group member Jonathan Love-all 13 songs here are "penned and twisted" by Mr. Love. Second, don't be deceived by the song titles. "Hark the Herald Angels Sing," for instance, is about a joyful visit from carolers, "until that last guy slipped;" and "Rockin' Around the Christmas Tree" morphs into an exploration of the pains and options of Christmas tree shopping, to the tune of "Meet The Flintstones." 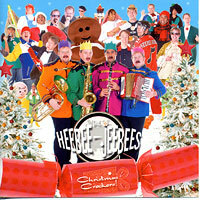 "I Saw Three Chicks" is a group-accompanied (yes, the Heebees are actually holding instruments on the cover!!!) Irish foot-tapping folk tune about shopper lemmings descending on a mall; and "It's the Most Wonderful Time of the Year" slips into "West Side Story's" "I Feel Pretty" to describe how the opposite is in fact true. And we couldn't even trust the classic "Grandma Got Run Over By A Reindeer," which adds several brilliant new verses that follow Santa's run-in with the local CSI team after Grandma's untimely "sleighing." The poignant, accompanied "It's So Hard to Be An Elf" is a down and dirty blues tune by a disgruntled Elf who'd "rather be a troll," "Rudolph the Red-Nosed Reindeer" becomes a horserace that Rudolph wins "by a nose;" and daddy slips putting the lights "Up On the Housetop." "Six White Boomers" is a rousing, crazed ballad of difficulties that arise on Santa's Australian run, and "You're Mean One, Mr. Grinch (The Green, The Bad & The Ugly)" is a legendary Western confrontation between the classic Dr. Seuss villain and "Sheriff Claus," sampling the theme from "Rawhide," among several others, on the way. Anyway, we may never be able to sing a "straight" carol, or think of Christmas the same way again. "Christmas Crackers" is one of the most creative, and funny, Christmas albums we've heard! Fasten your sleighbelts, the Heebie-Jeebies (Canadians Cedric Blary, Chris Herard, Ken Lima-Coelho and Jonathan Love) are coming to town with the most irreverent Christmas CD of all time! Just to give you a taste, the boys sing, to the tune of "Let It Snow:" "When you finally state your vows, you may think that's where lip-locking ends. If there's Mistletoe in your house, you can make out with all of her friends! Mistletoe, mistletoe, mistletoe." "Let's All Make Money at Christmas" features the line, "When folks are consuming, our profits are booming, at Christmas it's time to sell out!" Included are "Joy to the World" (sung relatively straight), "I'm Telling," "Winter Wonderland" , "Shopping Mall Santa Claus," "Mistletoe, Mistletoe, Mistletoe!," "Ebenezer," "Arrest This Bearded Gentleman," "Sox & Underwear," "Let's All Make Money At Christmas" and "Silent Night". Every twisted lyric is included in the festive liner notes. The CD fits nicely in a stocking, with ample room for a lump of coal (not included!). 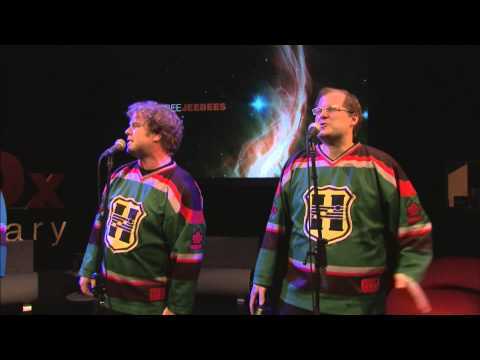 Canada's finest a cappella humorists are back...big time. The recording has a couple of their trademark maritime-styled (sea chanties) humorous twists on human foibles that bracket a mix of arrangements which take us, laughing, on a tour of musical varities. That vocal trumpet is great! Then there's "Channel 12" which is a gospel sendup of TV Evangelism-for-money which has been nominated for the 2001 CARA Best Humorous song. The entire recording has been included among the CARA nominees for Best Humorous Recording. Great stuff! You are in for a treat. This recording contains straight ahead a cappella covers with no production embellishments, sung to you by the quartet who placed first in the 1997 Northern Harmony, A Canadian A Cappella Celebration. Now even though these songs are recorded just the way you could hear them performed on stage, the vocal kazoo and trumpet chorus on "Rockin' Robin does provide a distinctive, playful, embellishment. You'll find "Good Lovin'," "Blue Moon," "For The Longest Time," "Under The Boardwalk" (nice gargle effect there), "Duke Of Earl," "Sesame Street" and more, eighteen tunes in all. Go Canada! Get Heebee-Jeebees! Canada's favorite all-male humorous a cappella quartet returns, dressed in surgical scrubs and having no qualms about suturing a "My Favorite Things" sample to a manic cover of "What I Like About You," the already silly "Guitarzan" gets sillier, a live crowd goes nuts on "Charlie On The MTA" and "Who Put the Bomp." There are spirited covers of "I Feel Fine" (with faux horns to die for), "Man of Constant Sorrow" (with a surprise sample of "Kumbaya"), "Walkin' On Sunshine," and the Monkees' "I'm a Believer" Also very funny are "Be My Yoko Ono" and the foot-tapping "Does Your Mother Know." 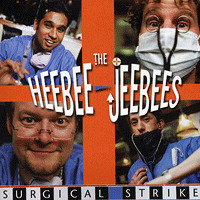 "Surgical Strike" joins a slew of excellent Heebees CDs in our catalog: "Xmas Nuts," "Heebee Jeebee TV," "Falalalala," "Waiting Under The Mistletoe" and "Hurry Up and Wait." These guys have about as much fun, on stage and in the recording studio, as any a cappella group we've heard, and so do we! It would hardly be Christmas without a new holiday release from our favorite Canadian merrymakers and the four lads are up to their usual mischief with this highly enjoyable recording. All is fair game as the group twists the lyrics to some Christmas standards along with a healthy dose of Christmas originals highlighting their songwriting skills. Poor Frosty will never be the same, The Merry Gentlemen seem to of gotten lost and ended up on Gilligan's Island and it sounds like The Little Drummer Boy may have been drinking. "Cowboy Christmas" tells quite a tale and I think they make it quite clear what they don't want for Christmas in "Sox & Underwear". It's not all silliness as these guys also show their singing chops on "Huron Carol" and the arrangements are fun throughout. A delightful Christmas title.